The 2014 Commencement on Saturday, May 10, at Grace College and Seminary will mark a year of firsts. Jacob Goodman will be the first graduate from the Grace/Trine engineering partnership with a degree in applied physics and Caleb Sanders will be the first graduate of the 3+1 blended program with a master’s degree in business administration. Also walking are first-time graduates from Grace’s new 3-year Reimagine program, the Medical Device Quality Management program, the Exercise Science program, and the Weber schools in Indianapolis and Fort Wayne. All are evidence of the new and innovative options at Grace that provides an affordable Christian education to more students. The ceremony begins at 9 a.m. at the Ronald and Barbara Manahan Orthopaedic Capital Center on the Grace campus. The ceremony will include an invocation by Rev. 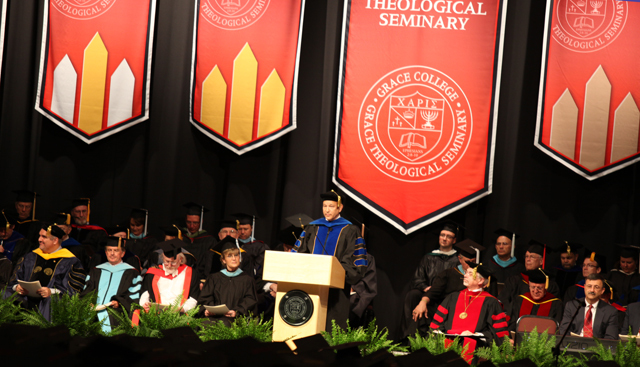 Keith J. Treadway, senior pastor at Bible Baptist Church in Kokomo, Indiana; an institutional welcome by Dr. William J. Katip, president at Grace College and a benediction by Rev. C. James Brown, senior pastor at Grace Community Church in Goshen, Indiana. The Lancer Chorus, directed by Thomas Hall, will be performing at the commencement services. This year, Grace asked the senior class to select a faculty member to appear as a special guest speaker during the commencement ceremonies. The students selected Dr. Tiberius Rata, assistant dean of the school of ministry studies at Grace. He will be speaking on the topic of grace. For the 2014 Commencement, Dr. Katip has chosen Dr. Paulette Sauders, the senior most faculty member, to carry the ceremonial mace. Carrying the mace is a great honor and is traditionally borne by someone who has been singled out for tribute. Dr. Sauders started teaching at Grace in 1965 and is respected greatly by students and faculty alike for her many years of dedication to the college. During the ceremony, Grace will honor Dr. E. William Male, who served 34 years at Grace as a faculty member and in other key academic, advancement, and administrative roles. In recognition of Dr. Male’s ministry excellence and for the generous gift the Males haven given to the school, Grace’s board of trustees renamed the seminary and graduate counseling building (formerly GBIM/Encompass World Partners) the William Male Center for Seminary and Graduate Studies. May 10 also marks the completion of the first year of presidency of Dr. William Katip, who stepped into leadership during last year’s commencement. Dr. Katip brings 39 years of higher education experience to the presidency and has been invaluable in guiding Grace Schools through many innovative changes since 2007. To see a list of graduates who, at their enrollment, indicated an affiliation with a Grace Brethren church, click here.